Is your Krups XP7200 series Espresso Machine leaking on your counter top? You may need a new flow meter. This part is used to sense and report the flow rate of water within the machine. This Krups MS-0A01717 flow meter is ready to replace your malfunctioning or leaking part, and because it is original equipment you van count on a perfect fit. 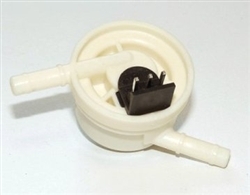 Use this part to repair your espresso machine and restore it to optimum performance. Krups Stainless Steel Frothing Pitcher 12 Oz. Krups Espresso Machine Power Button (Black) MS-0675141 Krups Espresso Water Tank Reservoir MS-0A01425 Krups Stainless Steel Frothing Pitcher 20 Oz.